The hype around Twitter has been growing enormously on the last weeks. Here in Brazil, writers from all around the web are writing and blogging about it everywhere. Almost everyone has a little blue bird on their blog side bar saying “follow me”. If it’s interesting, they acess it. Signer accesses his RSS reader and gets the whole post, no clicking needed. As I see it, to share news, RSS is simpler. No twitting nor clicking around. So, why use Twitter then? First of all, I don’t. I have an account, but rarely visit it. But, after reading and discussing a lot about it, I found out 2 interesting ways, one of which led to the recent hype. Real time search. Using Twitter, everyone has access to everyone’s opinions about everything. It’s a soup of ideas about any topic you might imagine, and whenever new topics arise, people twitt about them. So, using tools like twitter search, it’s possible to learn what people are saying right now about some interesting topic. It’s unprecedent. And that’s why Sergei Brin and Larry Page are saying Twitter is ahead of Google on it. Sharing comments. RSS exists to share news. Besides Google Reader recent advances on comment and sharing, RSS was not meant for it. Twitter wasn’ t also, but it does the job very efficiently. Whenever someone shares a link on twitter, they add a comment to it. They show their opinions to the world. So, you subscribe to a blog when you notice that blogger posts interesting stuff and you should follow someons when you see that someone posts interesting links and opinions. Thinking about it, using twitter to share comments and news could kill RSS because people would only read news shared by their friends whom they trust. But, where would their friends find the news? From other twitts? It’s easy to see that this recursion would lead either to a news corp or blog twitt or to a RSS feed. 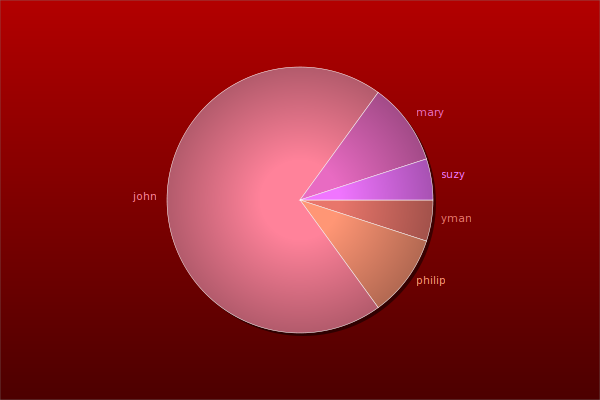 So, the initial “sharers” will have to find the news somewhere and, as said, the best way is through rss. So, calm down, RSS won’t die. A couple weeks ago, Magnun and I were trying to implement a new feature for CairoPlot 2.0, which will be called Series. At the time, we decided to create a draft of what we were doing before actually coding and versioning it. Both of us were stunned to find that an online colaborative programming ide didn’t exist. So we opted for Google Docs which filled the gap but not without some problems (as no syntax highlight). Today, Magnun just told me about the Mozilla Labs Bespin which aims to be exactly what I said before: an online colaborative programming ide right inside your browser. Check out the project link to see what has already been done. I do hope these guys keep going with this, the interface looks great and their idea of reinventing the wheel (as they did for the scrollbars and text input areas) is not bad as they do it for great optimization. Yeah, I finally gave up and decided to follow StackOverFlow users and Jeff Atwood advices and started to read Code Complete 2. Software construction is the central activity in software development; construction is the only activity that’s guaranteed to happen on every project. In the final analysis, your understanding of how to do construction determines how good a programmer you are, and that’s the subject of the rest of the book. And this last one must be too as *SO* many people recommend this book. What happens when a software enterpreneur and an offshore oil extractor come together? Roger Green (the software enterpreneur) and David Cook (the offshore oil extractor) came together and decided to board the 600 best software engineers around the world to live on a boat 3 miles away from the US pacific coast. Right outside imigration range. These guys will work 4 months and take 2 of vacations, which leads up to a pretty nice scenario of working just 2/3 of the year! For more information, take a look at A plan to offshore . . . just 3 miles out or just go to the official page of the project. One day, Jeff Atwood and Joel Spolsky decided to help the programming community. Along the way, other guys joined them (Jarrod Dixon, Geoff Dalgas, Jeremy Kratz and Brent Ozar) and they came with the absolutely fantabulous Stack Overflow. It’s definitely that: fast. For the last weeks, I’ve been browsing a lot through the hot questions tab and I barely found unanswered questions. It’s amazing how fast you can get an answer and, for what I’ve seen, it’s usually the best. The voting up and down associated with comments mechanism is also great, as you can learn through the answerer but also by everyone else’s knowledge. And they also have a badge system which rewards you depending on your attitudes (actually, by now I only have 8 bronze badges..). This thing has been growing so fast that even the most famous programmers are getting into it. Alan Kay, for instance, is already one of them. So, they have lots and lots of information there, go check it out! What’s your favorite programmer cartoon – The greatest achievement on indexing all programming cartoons out there! Convert list of ints to one number – This question is fantastic not for the question itself but for the answer this guy received. The one with the chart is incredible! CairoPlot has a mailing list! Sorry for the long delay on posts and updates, lots of stuff happening. So, CairoPlot now has a Mailing List as suggested by Yang. It’s actually a GoogleGroup named CairoPlot. Subscription is now open for anyone who’d like to discuss, question or suggest new features. CairoPlot now has a Mailing List! For more information, refer to: this post. 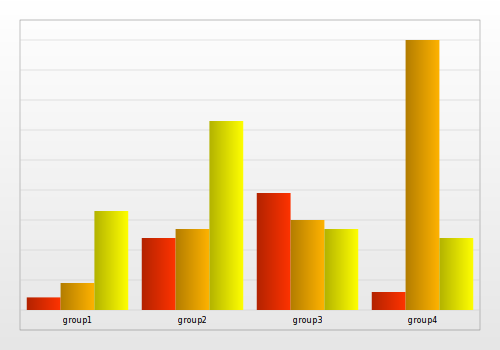 CairoPlot is an API written in Python and uses PyCairo to plot 6 kinds of graphics. 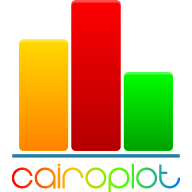 Lots of changes happened since last post, CairoPlot now has a Logo, it’s not just me anymore, we have an all new repository and lots of new functions and options. Read the rest of the post to see all the changes. As you all must’ve seen on the beginning of this text, CairoPlot now has a logo! Actually I did two but I ended up choosing this one. What do you guys think? It’s not just me anymore! I’m happy to say that this release had GREAT help from João S. O. Bueno. It was his idea to change the code into object oriented style which turned out to be a great option for the project. I’d like to apologize to everyone who’s been using v1.0 since June. Many changes happened and no one even knew they were there. By the time the repositories where changed, João had just started helping the project and lots of things were incomplete. After that, one change lead to the other and the only stable release came out now. Again, I’m sorry but I believe you all will be pleased by the changes. To visit the new repository, just hit CairoPlot Launchpad. I believe CairoPlot can grow a lot more, so if you think you can help, please contact me at alf.rodrigo@gmail.com. Now for the exciting ChangeLog. All the old functions are still supported with some little but important changes. 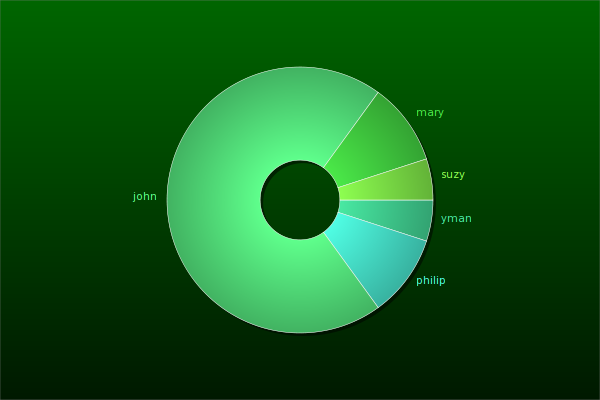 Every chart now has an associated class and a function. The functions where kept to maintain backward compatibility and allow for easy use of the api. The classes, however, provide much more customization as access to the cairo context or its surface. All functions still have the background parameter, but now it supports colors (in tuple form, red = (255, 0, 0)) and Cairo Linear Gradients. 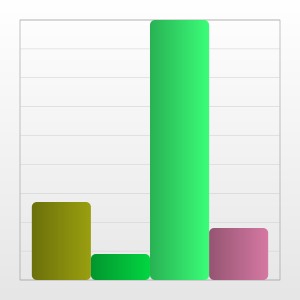 The None option is still present and will generate the gray to white gradient of the previous version. CairoPlot now outputs images on the following formats: pdf, ps, png and svg thanks to João. 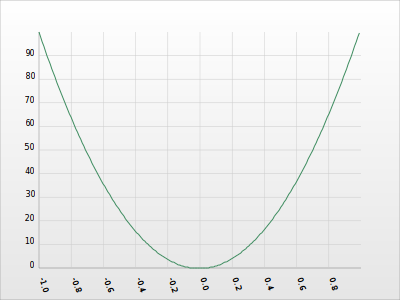 Dot Line Plot kept most of its functions but got a little more customizable. Note: As this function’s been present since the last version, please refer to the latest post for more detailed information. No cosmetic changes on this one, but as the rest of the api, it got refactored on OO and the overall changes also apply. Used to plot donut graphics. Used to plot function graphics. discrete – whether or not the function should be plotted in discrete format. Used to plot bar graphics. 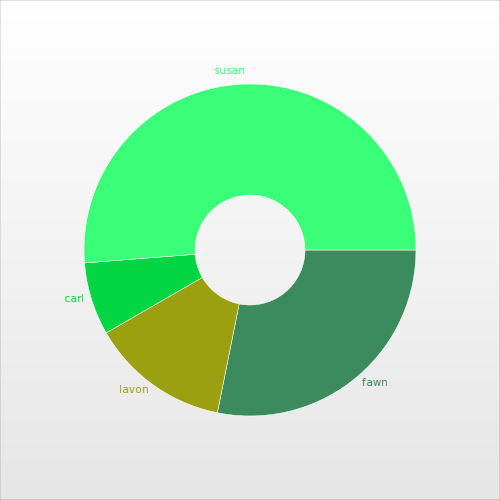 colors – List containing the colors expected for each of the bars. So, I hope you liked it. It’s been a while I’ve been trying to finish this release and I’m very proud of what it has become. Don’t forget to download and test it. In case any bugs surface or if you have any questions or suggestion, don’t be afraid to use the bug tracker or the answers options on the site CairoPlot Launchpad.